Scarce resources are changing the way people think about conservation and waste. As they recognize the call for environmentally sound behavior, more and more consumers seek to partner with manufacturers and distributors who are also tuned-in to green issues. And since product packaging accounts for at least a quarter of the landfill trash we create, reducing post-consumer waste generated by packaging has become an important concern in today’s retail marketplace. Innovative packagers are finding ways to balance the primary functions of packaging alongside environmentally friendly practices. Containing and protecting goods are essential functions of packaging, as well as keeping foods fresh and sanitary. Packages also furnish vital information to end-users and provide tamper-proof protection on store shelves. Without sacrificing these duties, packagers are stepping-up with creative solutions to reduce wasteful packaging. The Environmental Protection Agency advises consumers to reduce packaging waste as an important aspect of comprehensive environmental responsibility. When the environmental watchdog of the United States Government issues specific recommendations about packaging, forward-thinking producers and packagers need to respond with packaging solutions consumers deem earth-friendly. The EPA advises retail shoppers to compare the amount of unnecessary packaging found on competing products, before selecting goods with the most responsible package designs. The Agency’s tips for reducing packaging waste also instruct shoppers to express support for retailers selling goods packaged with minimal materials. And to reduce single-serving packaging associated with commonly used items, the EPA recommends buying consumer goods in larger quantities. As public and private consciousness grows, the most successful contract packagers maintain high environmental standards, striving to offer green solutions whenever they are available. Public relations drive repeat sales, so consumers’ concerns about waste have become an important talking point for corporations connecting with their customers. Large, multi-national companies like Unilever, for example have made specific commitments to reduce waste and maintain environmentally responsible packaging practices. By maximizing materials and leaning on lightweight packaging solutions whenever possible, the company has reduced its overall packaging waste-to-landfill impact by 11%, with ongoing goals to halve the total amount of waste produced, by 2020. Combined with the company’s pledge to reduce manufacturing waste, packaging reductions include efforts to eliminate unnecessary packaging, use lightweight designs, and concentrate their products to require less packaging. Recycling and promoting reusable containers are additional methods used by Unilever, which has also pledged to eliminate PVC use altogether. California leads the way with initiatives specifically assigning product packaging responsibility to producers, rather than leaving recycling and conservation decisions in the hands of end-users. According to the state’s Extended Producer Responsibility (EPR) initiative, also known as Product Stewardship, producers, packagers and distributors share responsibility for advancing waste reduction strategies designed to ease the impact of consumer discards. There isn’t a one-size-fits-all approach to reduce packaging waste. Success relies on a multi-headed approach, committed to carving out waste reduction at every opportunity. Reduce Package Weight – Lighter packaging is a goal shared by PepsiCo, which has successfully reduced its total packaging weight by 350 million pounds over the past five years. The gains represent the equivalent of removing 95 tons of packaging each day during the five-year period. Its current 16.9 oz. water bottle uses half the plastic of a comparable 2002 version. Hershey also made big gains by incrementally reducing the total package weight used to wrap candy bars in its popular Miniature Assortment bags. Though the new wrappers are each only .5g lighter, corresponding reductions in foil and paper use add-up to significantly improved packaging efficiency. 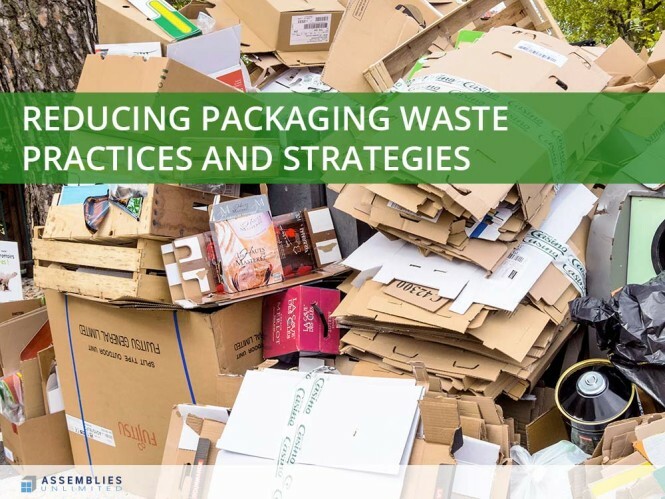 Use Cutting-Edge Materials – The volume of trash generated by packaging is significant, so even the slightest reduction in the amount of material used results in scaled benefits worth pursuing. Advanced Surlyn isomer resin from DuPont, for example, can be incorporated into paper-based pouches used for packaging dry goods and snacks. The effective film replaces traditional polyethylene-based flexible packaging, requiring one-third the material to get the job done. Seek Earth-Friendly Alternatives – Use of traditional wax-coated corrugated containers continues to decline, as environmentally conscious shippers turn to wax alternatives. In 2013, for example, the corrugated industry used 39% less wax than it did during 2002. Since wax versions are not recyclable, the drop in wax usage boosts the overall rate of corrugated recycling. Manage Transport Packaging – In addition to consumer packages used for marketing and merchandising, most products require secondary packaging during transport. Used to protect products from punctures, exposure and other damage caused during shipment, corrugated boxes and other secondary shipping materials add to the overall impact of product packaging. As a result, reducing transport packaging waste has a significant impact on total discarded material. Efficient boxing and pallet placement are at the heart of waste reduction, maximizing every available inch during transport. Simply sizing boxes correctly reduces the need for excess packing material as well as making the most of each shipping run. And reusable transport packaging furnishes additional efficiency, streamlining waste during shipment and handling. Rather than using traditional boxes and pallet packing materials, waste-conscious shippers rely on reusable bins and slip sheets to reduce transport packaging waste. Reduced packaging waste is a priority for producers, consumers, and government agencies committed to responsible environmental practices. By reducing package weights and streamlining designs, commercial packagers are generating less overall waste than their predecessors – and saving money in the process. Advanced materials and reusable transport packaging add further benefits for forward-thinking packagers seeking greener outcomes, as earth-friendly alternatives continue to eclipse wasteful packaging practices.